Instant Pot Recipes You *NEED* To Make (Gluten-Free)! Loving your Instant Pot like I am? 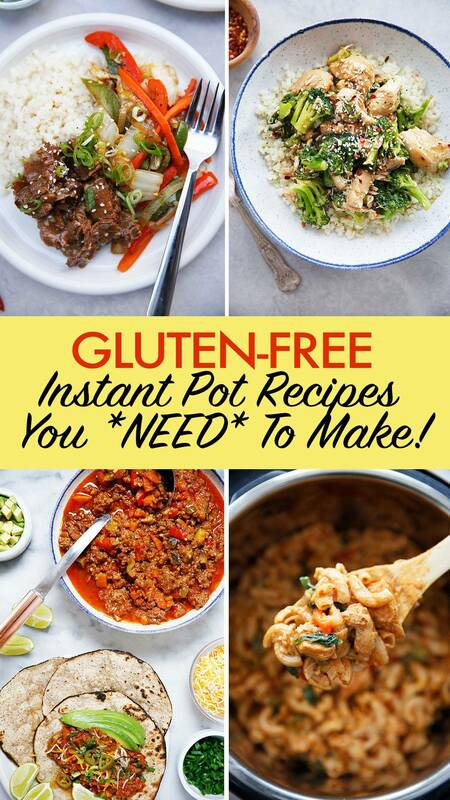 Here are over 50 gluten-free Instant Pot recipes you *NEED* to make! I’ve also answered some FAQs about the Instant Pot that may help you if you’re a beginner! What can I cook in instant pot? Lots of things, but let me say, not EVERYTHING. I’ve seen people wanting to make every single thing in the Instant Pot and I don’t think it works like that. It’s used for convenience. It cooks fast and definitely can cook things uniquely that you can’t get over the stovetop. With that said, it cooks food using water or other cooking liquid. Pressure is created by boiling a liquid, such as water or broth, inside the closed pressure cooker. The trapped steam increases the internal pressure and allows the temperature to rise. So since it steams, you wouldn’t want to make things like steak in your pressure cooker. Does that make sense? Based on what you’re cooking, add a cup or so of cooking liquid or of water to the pressure cooking pot. Lock the lid in place and make sure the valve is in the sealing/pressure cooking position. Select a pressure cooking button and let it cook! Use quick release or natural release (see below) once done, then enjoy! 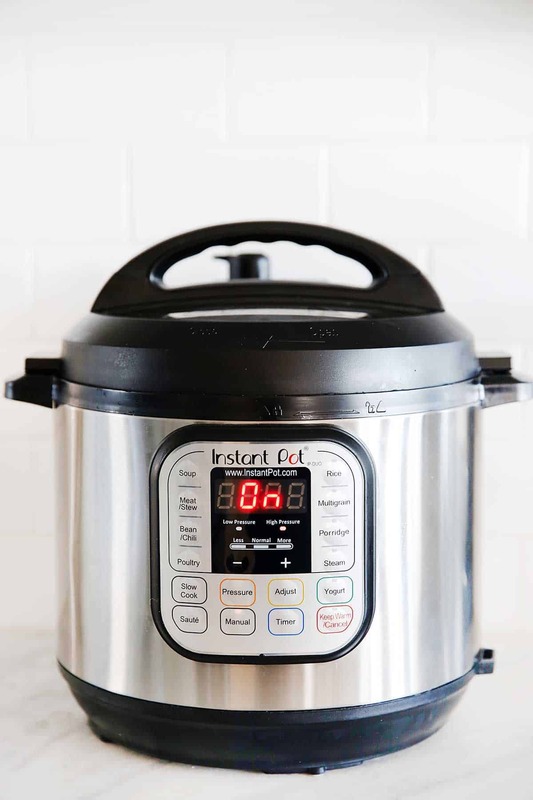 The Instant Pot is a multi-cooker that does the job of an electric pressure cooker, rice cooker, slow cooker, steamer, yogurt maker, sauté/browning pan, and warming pot. It’s a single appliance that does the job of seven different kitchen appliances or tools. How do you quick release the instant pot? You turn the valve from sealing to venting once it beeps that it’s done cooking. How do you natural release the instant pot? You let it be! Once it beeps that it’s done cooking, do nothing! It will natural release and when the silver knob drops down, you’re ready to open. What Instant Pot Recipes would you like to see? Great job!! I would love some gluten free dessert recipes for our Instant Pots. Thanks Lexi!!! This is super helpful! I’m so torn on getting one, but I’m torn because it seems like everything can also be done in the slow cooker. So my question is how is the Instant Pot different than using slow cooker? It’s a pressure cooker and cooks things fast. Totally different!! I am super duper duper (can you tell?) excited to try risotto! I have never made it because I know you normally have to stand at the stove top and stir for 20 minutes, so I basically just order it out on my birthday! Last week, I used the saute’ function on the Instant Pot for the first time. I think I have had it 2 or 3 years! What can I say? Scares me. But I did it…so nice to do everything in one pot!! Hi, I’d like to see more non-meat recipes. Also, seafood recipes. Totally needed this list of deliciousness! Pinning! cooker, but that’s what I’m used to. So I’m having trouble knowing how long in the Insta Pot. Hi! I love the groupings you’ve done (paleo, gluten free, etc..). Another one that would be very helpful to my family and others is Nightshade Free. I know it’s not as widely known, but nightshades are very inflammatory and many people are sensitive to them. Thanks!